L: 19.5" x W: 25" x H: 40"
Venice Dining Chair This Venice dining chair combines the small-scale coziness of casual dining with a more formal feel. It features a warming merlot finish and espresso-colored seats that provide a beautiful 2-toned look. Plus, the faux leather seats are easy to clean. This Venice dining chair combines the small-scale coziness of casual dining with a more formal feel. It features a warming merlot finish and espresso-colored seats that provide a beautiful 2-toned look. Plus, the faux leather seats are easy to clean. Hardly used these chairs and two out of four are coming apart at the seems. The dining set is perfect. My wife was surprised and loves the set. I Love the chair and the salesperson I had at the store was excellent, very helpful.I could never go to another furniture store and get the quality that I get here.Keep up the good work. This made the dining room table stand out and very comfortable. Me and my family fell in love with them first moment we saw them and the style is so modern. They add such a beautiful look to table. Elegant, comfortable and excellent quality! 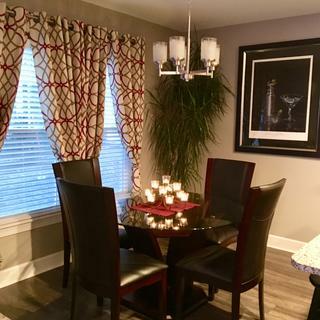 Love how my dining room looks! I searched forever for just the right Parson style chair and was beginning to feel like Goldilocks and the Three Bears - you know - this one's too bulky, this one's not comfortable, this one's cheap looking. But then I found these - they are elegant, compact, well made, a breeze to put together, comfortable, quality materials - I love them. And Douglas the salesman was wonderful to work with - no pressure - but helpful when you needed him. All in all a great experience. Easy to clean , comfy , classy and very sturdy . We received set up and delivery for our table and first set of 4 Venice dining room chairs and we were extremely happy with the set. 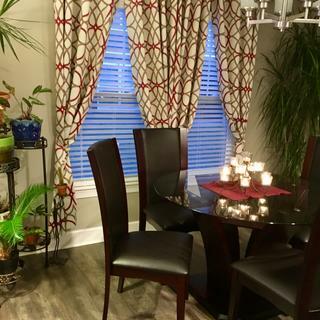 The set is elegant and really makes the space look wonderful in our home. We ordered and picked up two additional chairs that we had to assemble ourselves. The pick up and set up was a breeze and we are happy that we made this purchase we get compliments on it all the time. touches on my newly remodeled kitchen. Very comfortable and beautiful!! The salesman was friendly and directed me to exactly the service I was looking for. Price was great! Delivery was quick and setup was perfect. Thank you! An upgraded and a perfect combination with my old kitchen table. Beautiful chairs and a showcase like a glass table top with a perfect lazy susan on top of it. It made my kitchen looks like new. These chairs are wonderful. I love the high back. Very comfortable. 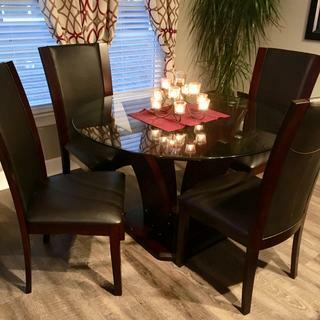 I purchased four Venice Dinind Chairs along with table to compliment my new dining area in my home. The comfort and style are truly amazing . I would recommend these chairs to anyone looking to furnish their home. These kitchen chairs are very comfortable, & very beautiful. I bought them to replace an old set of kitchen chairs, & I am very happy with them. They were very easy to assemble & are very well built & sturdy chairs. 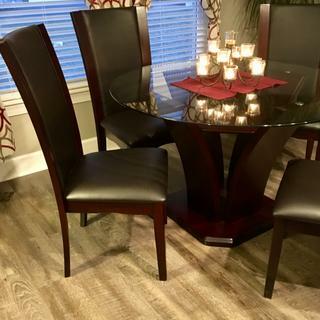 I definitely highly recommend them if you are looking for a set of great, comfortable dinner table chairs that will last for many, many years. Let me tell you this is my heaven. It literally is heaven in my living room. I look forward to coming home. I turn on my electric fire place and I cuddle on my heaven with a cozy blanket and a glass of wine. And that’s it. I be er want to leave. HEAVEN!!!!! I fell in love with the set the moment I saw it. The seats are extremely comfortable for extended sitting during an event. I like these chairs, they are super comfortable and have just the perfect height for my 5 yo. The cappuccino is extremely dark looking more like black. 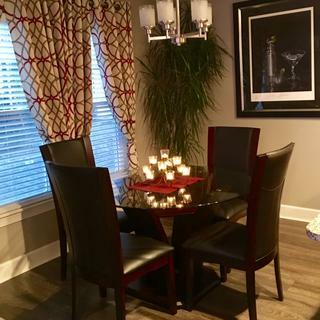 They are simple yet modern chic to give the dining room an elegant look. It looked like it did in the picture and I am happy with the chairs. The workers were very professional and they were only here for a short period of time. Super comfy set that goes well with my black lacquer dining table. These chairs are beautiful, very sleek and modern. They are also comfortable and food wipes right off. We are so thrilled with our new dining room chairs. They are extremely comfortable and look very elegant. I have gotten numerous compliments on them. I feel very confident now when I am entertaining that my guests will be super comfortable. These were not very expensive but actually look like they are. Definitely recommend them. I have always loved to various styles and selections that RnF has both online and in their stores. Never thought that I would love this set as much as I do when we have decided to downsize from our full dining room set. I love my chairs! Great purchase. I absolutely love love love my new chairs, they are strong sturdy and comfortable. I love them they are pretty and were ez to put together. Absolutely love these chairs. I did not give five stars because they are still brand new. I have to see how they do over time. Great chair however wood split when heavy person sat down in chair & leaned back. Unfortunately did not purchase the additional coverage. Good chairs. Wish they had more padding. two out of the four chairs were rarely used and started cracking at about a year. how wide is the seat? BEST ANSWER: The seat is 25" wide. What color is espresso considered? BEST ANSWER: dark roasted coffee beans. more toward black than brown. a bit elegant. Looking to purchase floor protectors for these chairs. Want them prior to our delivery. Could someone measure the bottom of the legs of the chair so I can get the correct size? BEST ANSWER: Hello Rena! The Venice Chair leg base dimensions are 1.65" x 1.65"
The chair I saw today and ordered look like black faux leather. Later I saw on the receipt the words espresso. Is the faux leather black or brown? BEST ANSWER: The Venice Dining Chair is a faux leather brown (espresso) fabric color. is the leather brown leather or black leather? Basically is the entire chair brown? BEST ANSWER: The entire chair is brown. What is the seat depth? BEST ANSWER: The seat depth is 18". BEST ANSWER: The weight capacity is 250- 300 lbs. What is the seat height - floor to seat? BEST ANSWER: The seat height is 18". BEST ANSWER: Assembly is not included as part of our free in store pick up. On the Venice dining chair, the legs may need to be attached to the chair base. The seat is faux leather - What is the back part of the chair - faux leather, wood? BEST ANSWER: The back of the chair is also faux leather. What is the seat height?